Among the many attractions of The Wynn Hotel is its 18 hole golf course, the only one of its kind in Las Vegas, and which was redeveloped when The Wynn was being constructed. Playing golf amongst beautiful greenery in the middle of the desert is no odder than anything else in Las Vegas, although the site of rolling expanses of lush green lawn certainly makes you do a double-take as you travel past it on the Monorail (above). However, with spiralling land prices, the temptation to cash in on the huge plot of land on which the golf course sits has encouraged Steve Wynn, The Wynn’s owner, to consider redeveloping it. So if golf’s your game, and you fancy playing in the middle of a desert, better get your round in soon (if you can swallow the $500 per round it costs! 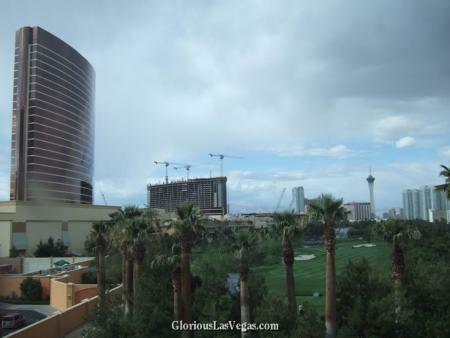 ), as Wynn has plans…big plans! 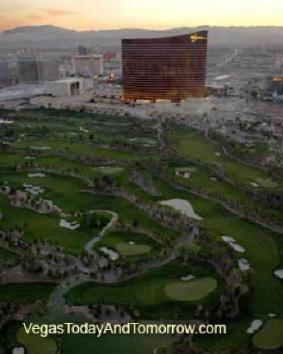 Adding an 18 hole golf course to your Las Vegas hotel and casino might seem a bit odd, but The Wynn was built on the site of the former Desert Inn Hotel, which also had a golf course. Wynn himself is a golf fan (he designed the course with Tom Fazio), and given that he paid for the hotel himself, who are we to argue if he wanted his own golf course on it? Now, though, it’s beginning to look like an underused resource. The area around The Wynn (the hotel, not the man!) is suddenly the hottest place to be in Vegas, with all manner of new multi-billion dollar properties suddenly springing up, and Wynn has spotted an opportunity. Although no detailed plans are available at the moment, Wynn is reported to be considering building a huge mixed use resort on the scale of the $7.7 billion Project CityCenter, complete with four boutique hotels comprising some 5,000 rooms, several condo high and low rise buildings, and a large central lake. So if you want to play golf in Vegas, you’ve got maybe a year or two in which to do it – otherwise, your lovely golf course will be transformed into firstly a giant construction site, followed rapidly by yet another huge mega resort! Steve Wynn; a man of great courage, vision and wisdom! I am to proud that i worked for him many years ago. He’s the real mr. las vegas.